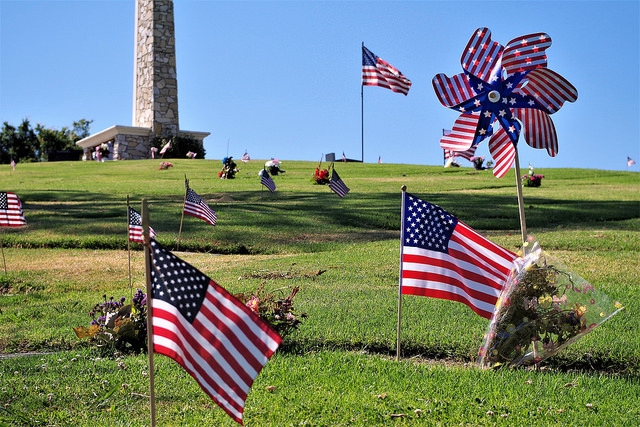 Memorial Day Rituals | Kid Reporters' Notebook | Scholastic Inc.
One of the many cemeteries across the United States that pays homage to the fallen on Memorial Day. A year after the Civil War (1861-1865), Americans began to officially grieve for the more than 600,000 Union soldiers who had been killed in battle. Since then, Memorial Day has been celebrated on the last Monday of every May. It is a time to honor those who have died while serving in the United States military. People come together in communities across the country to pay their respects with parades, tributes, and ceremonies. In many cemeteries, wreaths are placed on the gravestones of fallen soldiers. Flags are flown at half-mast. This year, on May 28, I participated in a flag ceremony at Bethesda-Chevy Chase War Memorial with my Boy Scout troop. The event honored “those men and women of the Bethesda-Chevy Chase area who gave their lives in the defense of our country.” The inscriptions on the memorial, which was dedicated in 1960, included those were killed in World War I, World War II, the Korean War, and the Vietnam War.